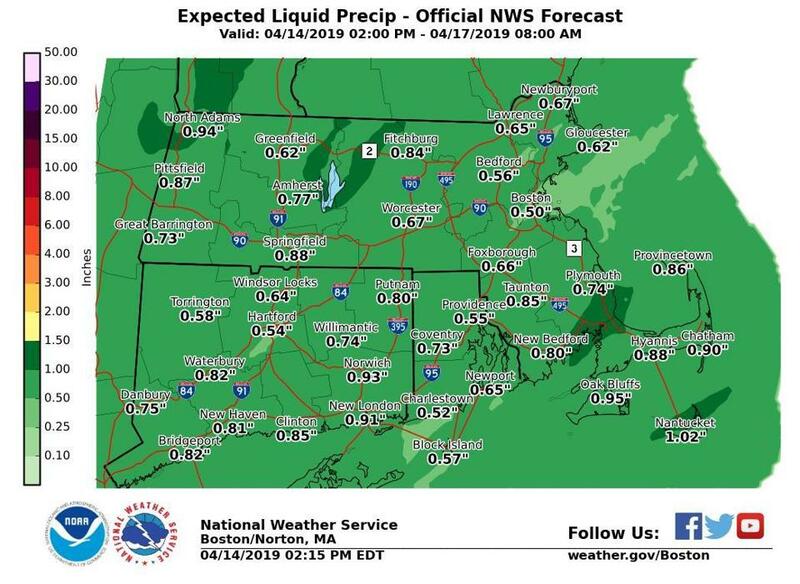 Forecasters at the National Weather Service are predicting an overall warm day in Boston with temperatures in the 50s and 60s — with heavy rain and thunderstorms between 5 a.m. and 9 a.m.
Luckily, the threat of rain is expected to taper off throughout the day. Whether you get caught in the rain really depends on when you’ll be out cheering in the crowd or crossing the finish line, according to the weather service. At 9 a.m., when the wheelchair athletes begin racing, they can expect a 68 percent chance of rain and temperatures around 63 degrees. At 10 a.m., when the elite men take off towards Boston, they can expect a 32 percent chance of rain and temperatures around 64 degrees. At 11 a.m., when the top wheelchair athletes are expected to cross the finish line (between 10:20-10:32 a.m.), they can expect a 12 percent chance of rain and temperatures around 66 degrees. At noon, as the winning runners are expected to cross the finish line, there will likely be a 14 percent chance of rain and temperatures around 69 degrees. At 1 p.m., if you’re heading out as a spectator, this is likely a good time to catch a lot of the race without getting wet, as forecasters expect a 13 percent chance of rain and temperatures of 71 degrees. At 4 p.m., if you’re planning to still be cheering runners on or be fighting towards the finish line, you can expect to see a 44 percent chance of rain and temperatures around 64 degrees. And, a bit of good news for athletes: In addition to the rain and the temperature, forecasters are also expecting a tailwind for the competitors. So even though there’s still a chance you could get wet, at least it’s not expected to be as cold, windy, or rainy as last year, or — on the flip side — dangerously hot. For more information, visit the National Weather Service’s Boston webpage, or follow @NWSBoston.